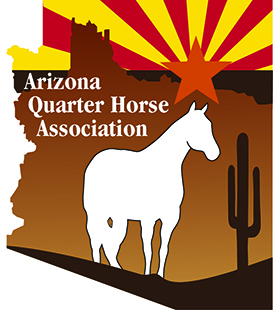 The AzQHA gives year-end awards in all AQHA classes approved by AzQHA, including Youth, Amateur, Select, Novice and Open if offered, in at least 4 events listed on the AzQHA web site event calendar by the end of the qualifying period, which is December 31. To earn State (AzQHA) show points for year-end awards, the owner of the horse must be a member of the AzQHA. Youth and Amateur riders must be members of the AzQHA to earn show points for year-end awards. AzQHA points system is viewable/printable by clicking here, and National AQHA points are downloadable from AQHA. You will need your AQHA membership number to download points from AQHA. your correct AQHA numbers. If you are a youth member and a family member owns the horse you exhibit, we must have the family members AQHA number on your membership file also. In all cases, membership must be paid before ANY points will count. The exhibitor is responsible for proving that membership is paid, either by receipt from show secretary or cancelled check. In all classes except open, points are kept on a horse/rider basis. For Youth and Amateur divisions. If two riders show the same horse, a separate set of points will be kept for each horse/rider combo; if a rider shows two horses, a separate set of points will be kept for each horse/rider combo. AzQHA recognizes the popularity of the all-breed classes at our No Bling Shows. Starting in 2018, exhibitors and horses that show in the all-breed classes at the No Bling shows will be eligible for AzQHA year-end awards. If an exhibitor or horse wins first or second in an AQHA class they will not be eligible to win the All-Breed year end award in that class. The next highest point earner in the All-Breed class, that was not first or second in the AQHA respective class will be the year end award winner for that class. Awards are for Champion and Reserve Champion in each All-Breed classes. All classes that are available in the No Bling shows are eligible to win a year-end award for the highest point winner in each class. Ties in year end points will be broken. There will only be one Champion and one Reserve Champion in each class. Highest number of All-Breed classes entered by a horse/rider combo at No Bling events. The exhibitor(s) that lose the Champion tie breaker will then all be named the Reserve champion. No other awards will be given to lower placing points. The exhibitors(s) that lose the Reserve tie breaker will not receive any awards. Only one Reserve Champion award will be given. Each horse/rider combo with the highest points at the end of the qualifying year (January 1- December 31) in the All Around VRH shows will qualify for Champion and Reserve Champion awards. Qualifying for All Around at any given show requires the same horse/rider combo and compete in Ranch Conformation, at least 1 cattle class (VRH Ranch Cutting and/or VRH Ranch cow Work), at least 1 non-cattle class (VRH Ranch Riding, VRH Ranch Trail or VRH Ranch Reining), as per the rules of AQHA. Only the High Point VRH Ranch Horse will require the above mentioned classes to compete for the High Point VRH Ranch Horse award. There will be class awards for Champion and Reserve Champion for individual held VRH classes throughout other shows and these awards and rules are mentioned below in year-end award rules for classes. Points will be calculated on each horse/rider combo for each division. Ties in year end points will be broken. There will only be one Champion and one Reserve Champion winner. The exhibitor(s) that lose the Champion tie breaker will then all be named the Reserve champion. No other awards will be given to lower placing points, except in Youth that will receive awards to 4th place in the same manner. Highest points in the Ranch Cow Work. Number of events attended other than Sun Circuit and Az Fall Championship. The exhibitors(s) that lose the Reserve Champion tie breaker will not receive any awards. Only one Reserve Champion award will be given. All year end awards are based on 9 scale point system: Points are awarded 9,8,7,6,5,4,3,2,1 if there are nine or more in a class. If there are fewer than 9 entries points shall be awarded based on the number of entries (4 in a class, 1st place receives 4 points, 2nd place receives 3 points, etc.) Only horse/rider combos that are competing in VRH All Around shows will be counted for the year end points. Qualifying – to qualify you must show in at least 4 events (ie. Sun Circuit is one event, A No Bling show is one event) listed on the AzQHA web site (www.azqha.org) event calendar by the end of the qualifying period which is December 31. Awards are $1000 gift certificates for Champion and $500 gift certificates for Reserve Champion. There will be an extensive group of names on the list of award choices that the winner can choose from at the end of the qualifying year for the gift certificate. Exhibitors must be the high point winners from the listed Hi Point divisions below, each award is based on a one horse/one rider combo. Notice that some divisions may include one or more divisions but only the one high point winner of that division will receive the award (ie Youth or Novice Youth / Amateur or Select). You MUST have points from 4 events to qualify for the high point awards. Note that points many not show up until you have gone to 4 events. Highest number of AQHA points entered by a horse/rider combo at AzQHA approved events. Highest number of AQHA points earned by a horse/rider combo at AzQHA approved events. Classes to be counted: showmanship, horsemanship, equitation, western pleasure, western riding, trail, hunter under saddle, jumping, driving, and halter. All points are counted on one a horse/rider combo. In the open division the owner of the horse will be the recipient of the award. Qualifying – to qualify you must show in at least 4 events (ie. Sun Circuit is one event, A No Bling show is one event) listed on the AzQHA web site (www.azqha.org) event calendar by the end of the qualifying period which is December 31. If a class is not offered at a minimum of 4 events the exhibitor must have shown to at least five judges during the calendar year. Awards- Class awards for Open, Amateur, Select, Youth, Novice Youth, and Novice Amateur will now be given for Champion and Reserve Champion only. All ties in year end points will be broken. There will only be one Champion and one Reserve Champion in the year end class. Class Rules: All classes shall be conducted in accordance with the current AQHA rulebook that will apply unless otherwise stated. Updating points: Points are updated to the AzQHA web site as soon as AQHA has them available. It is up to the exhibitor to contact the point keeper as soon as possible if you feel your points are not correct or missing. The exhibitor must contact the point keeper before December 1st to have any changes in the year end point standings changed. We would ask that you check your points after each show that you participate in to keep the points up to date for everyone. Select Exhibitors: All Select exhibitors must declare if they want their State year-end points to count only for Select points. Once you have declared to be Select for the year then all State points will be counted as Select points even if you go into Amateur classes or are combined to an All Age Amateur class at a show. If you do not declare as a Select or you want your points to count for which ever class you show in you do not have to do anything for us to count your points. AzQHA needs you to declare, if you are a Select by February 29th. If you have already renewed or if this is a new membership, fill out the information on the new membership form at time of application. SCHOOL DAYS: AzQHYA youth classes held on a school day (Monday – Friday) will not be counted towards AzQHYA year-end points. Only Saturday and Sunday classes will count for state youth points. At the Sun Circuit or Arizona Fall Championship- classes will count for state year- end points (Saturday & Sunday only) but only classes that are 18 & under will qualify for Youth world show points. See below for qualifying. YOUTH STATE QUALIFYING: At the Sun Circuit show & Arizona Fall Championship show, ONLY timed events, cattle classes, and over fences classes will count for state qualifying (Saturday & Sunday only). With all other state qualifying shows all classes will count towards qualifying that are 18 & under classes and held on Saturday & Sunday only. Exclusions are for cutting and team-penning classes, which can be offered any day of the week and will count towards youth qualifying. * AQHYA National qualifying dates – May 1 – April 30. All shows will count starting from May 1st until April 30th for youth qualifying but only on Saturday and Sunday will points count for qualifying and must be 18 & under classes. AzQHYA welcomes all youth whether showing or not, to join in our affiliate. AzQHA is proud to have a long history of supporting our Youth World show team and sponsors the Youth World team by paying for stalls and entries. Our goal is to send the best Youth team to the AQHA world show in Oklahoma City and to create fun, excitement and learning opportunities. AzQHYA members may be on the Youth World team in two ways. All youth that show and receive the necessary AQHA qualifying points for each class can nationally qualify to be on the Arizona team. Those that do not qualify nationally may be on the youth team by state qualifying in their classes. The state qualified youth must be one of the top 4 point earners in the state points for the qualifying year. The Youth Advisor may allow up to 6 state qualifiers in certain more popular classes. All youth world show team members both nationally and state qualified must complete 8 hours of community service. A signed letter must be given to the youth advisor and the letter must show where and when the hours were completed.